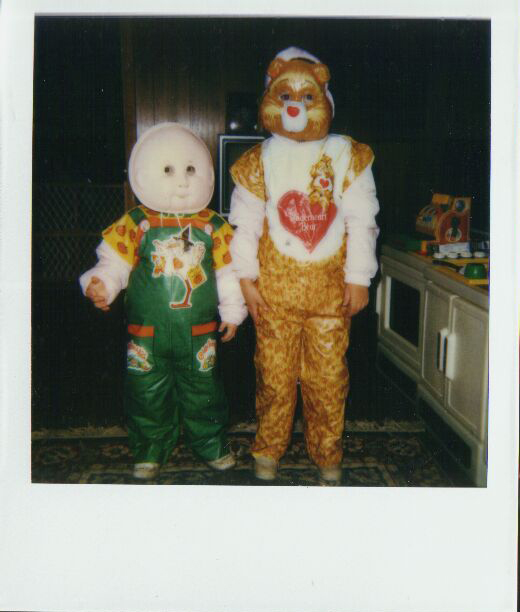 I’m Tenderheart Bear in this one, I think this might have been from… what, 1987? Once I got a little older, I discovered the world of more exciting costumes. I’d try and find something better and fancier than the previous one, because dangit, I wanted to pretend I was someone else for the day. And once I got old enough to handle a sewing machine with some skill, I started making my own costumes. They may not have been amazing, but I sure as heck felt awesome in them. 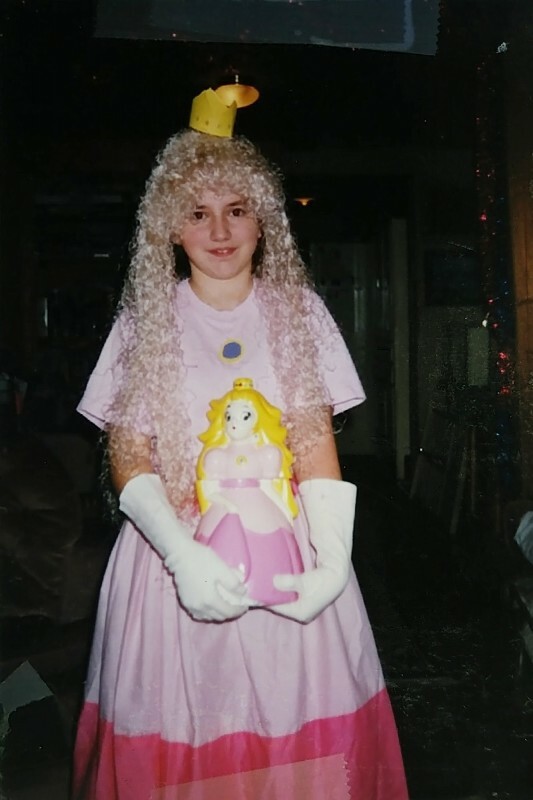 Case in point: my first ever costume, a handmade Princess Toadstool costume from 1997. Granted, my sewing skills were still pretty limited at this point, so the only part of the costume that involved any sewing was the skirt – but my thrift store skills were epic even at the tender age of fifteen, and I managed to get everything else I needed to put together that costume – gloves, pretty red heels, and a floofy petticoat. Sure, the crown and brooch were made out of construction paper, and my wig was a cheap one from Spencer’s that smelled horrible, but dangit, I was Princess Toadstool, and I was happy. 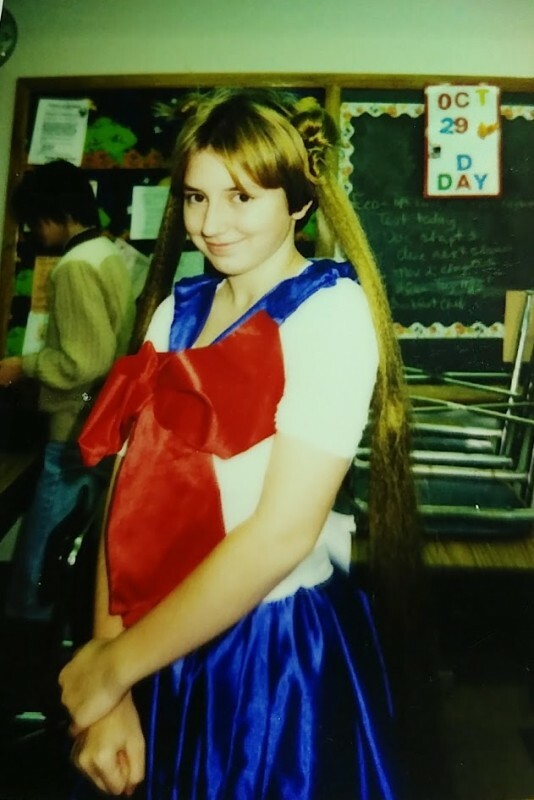 I don’t think I actually dressed as anything back in 1998, sadly, because of reasons to do with my mother being, well, my mother (we won’t even get into that right now), but I went ALL OUT for Halloween in ’99, as it was my last one in high school: I went as Sailor Moon. And given that I had to put the costume together by hand (as my sewing machine privileges were revoked), and that some parts of it were held together by staples (yeah, I still cringe at the thought of that), it came out amazingly. For something I made mostly by hand, held together in part by staples,, this came out pretty well! My dad and one of my friends helped me out a lot with this one – my dad got me the bodysuit and gloves, and I can’t quite remember which friend took me to get hair extensions (I think it might have been Erin, she was the only one with a car at that point). I must have convinced my mom somehow to take me to Jo-Ann Fabrics – which rarely happened, and which is why Jo-Ann’s trips are still special today, hah – to get the fabric for the rest of the outfit. I didn’t have boots, but I did have the red heels from Princess Peach a few years ago, and I said “good enough!” I had the Crescent Moon Wand. I borrowed Sailor Moon’s transformation brooch from my friend Patty. And oh, I rocked that costume. I loved it so much. It even worked well without the tiara and transformation brooch – I could easily switch from Sailor Moon to Usagi! 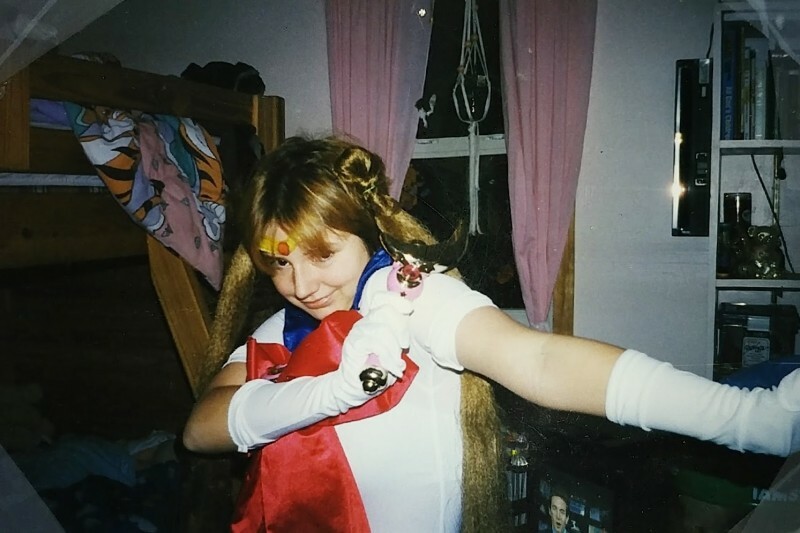 I think I loved that costume even more than the official Sailor Moon costume I grabbed from Spencer’s when I was in college – even though it was handmade and held together with staples and magic in spots. Then I went through some pretty rough years, finance-wise and life-wise. There were no brand-new costumes for me – so I ended up re-purposing old costumes to make new ones to wear. 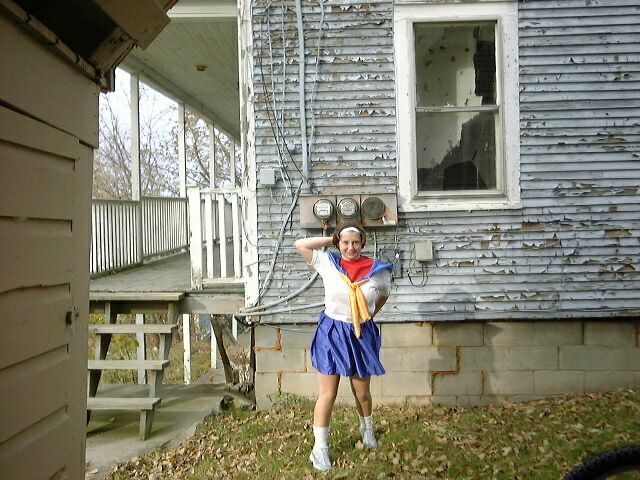 The Sailor Moon costume from high school, for example, got new life in part as the bottom part of my Sakura (from Street Fighter) costume in 2002. I think it won second place in the costume contest at the K-Mart I was working at, hah. I was pretty darn proud of it! However, that Sakura costume was the last one I made for a while – until 2006, when I realized that people wore all sorts of costumes to conventions and I didn’t have to just shyly wear my mostly-handmade renfaire gear to a convention! 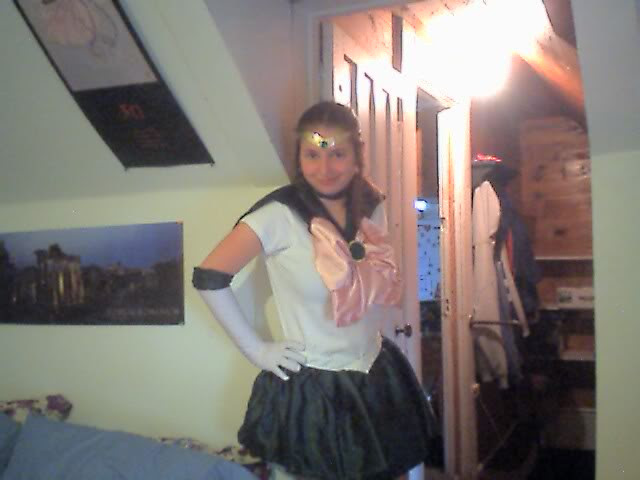 I went as the tiniest Sailor Jupiter for I-CON 2006. And I went nuts with making sure this costume was perfect. I wanted to make sure I got all the tiny details down pat – the rose earrings, the boots, the little green hair baubles, the tiara, and even the brooch on her bow: I made them all. I had to wear a wig, because my hair was too short at the time, and managed to find one that was perfect for the costume. I sewed the outfit by hand in my at-the-time-boyfriend Franco’s basement, and it came out really well – even if pretty much every picture I have of it came out crappy, due to the potato quality of digital cameras back in 2006. And from there, I was bitten by the costuming bug hard. I made at least one costume for every convention I attended. 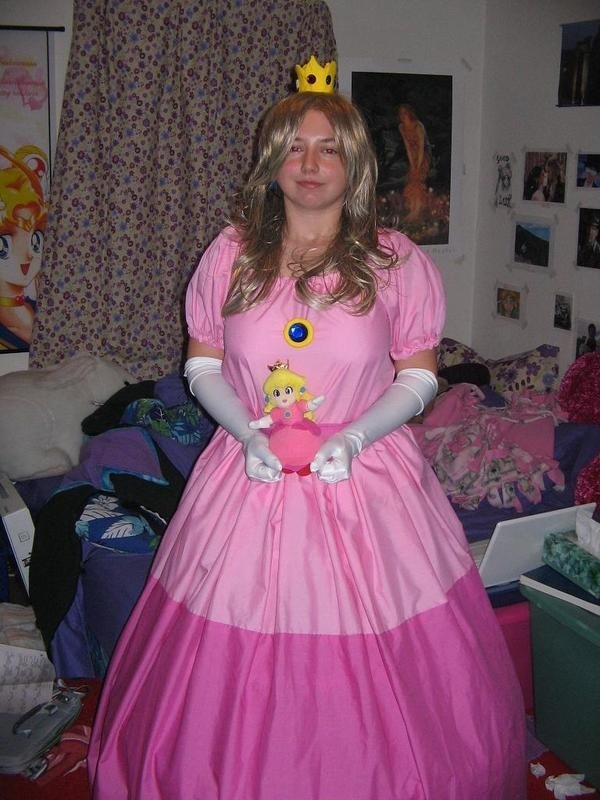 Princess Peach got resurrected for I-CON 2007, Halloween 2008, and Bear-Con in 2011. With my better costuming skills at this point, my redo of Peach came out amazingly. And then I’m sure you guys are all familiar with what came next. The first version of Pinkie Pie! Holy crap have my costuming skills gotten better (and the shape of that wig gotten worse) over the years. That’s right – in 2012 I debuted my first try at everyone’s favorite party pony, Pinkie Pie. The first costume was alright – I was recognizable, at least, but I wanted to make it better. And so I did. 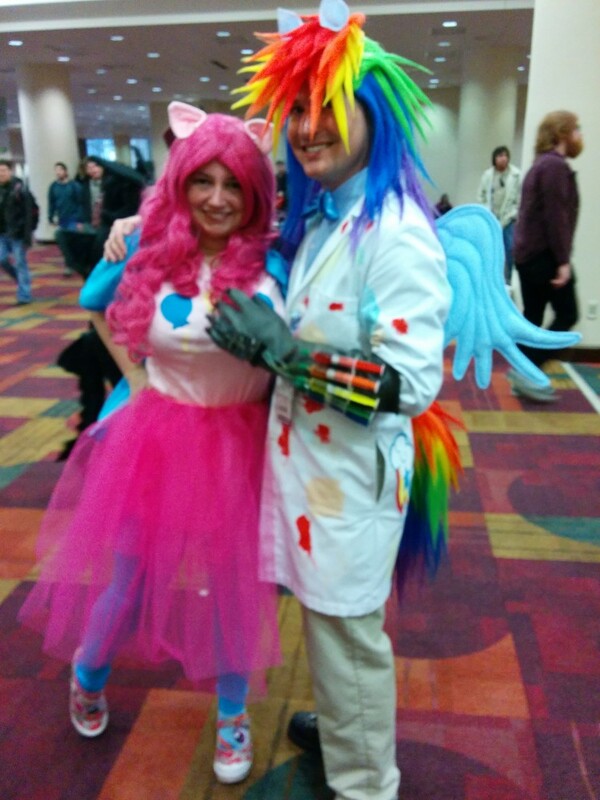 2014 Pinkie Pie with Rainbow Factory Dash. Cupcakes Pinkie with Ash from Army of Darkness! I also ended up making an appearance as everyone’s favorite scarf-wearing Doctor at Gen Con 2013, as you all might remember! 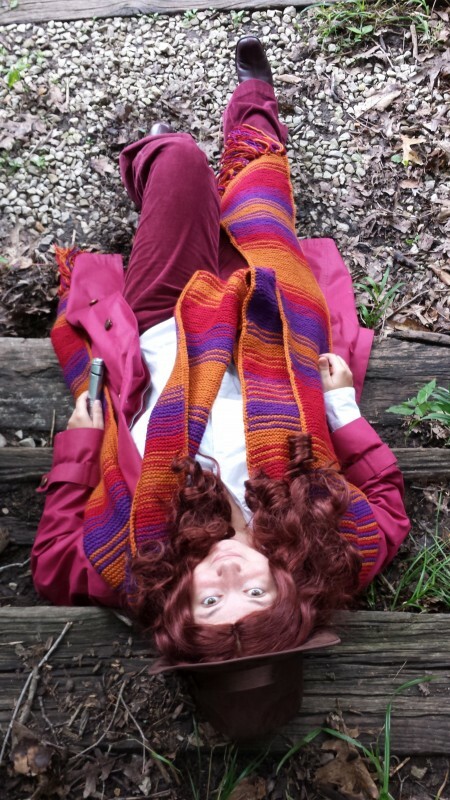 One of my favorite shots of my 4th Doctor costume. Gen Con 2013 was a good year for costumes. 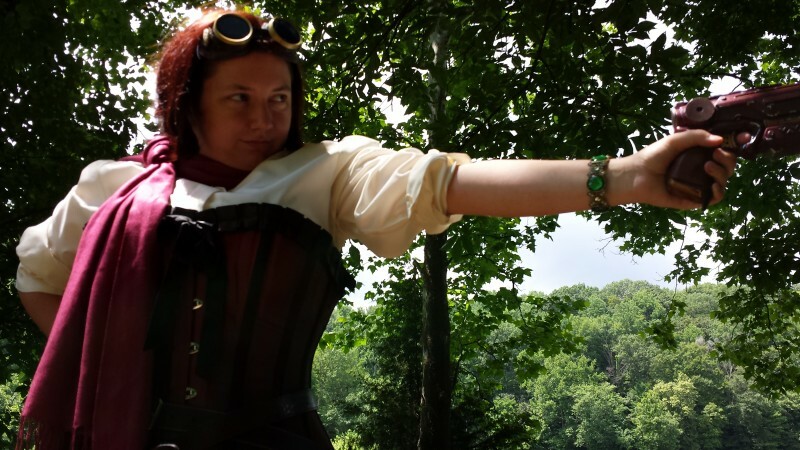 I also debuted my first steampunk outfit, which was so much fun to put together. I ended up marrying this guy! 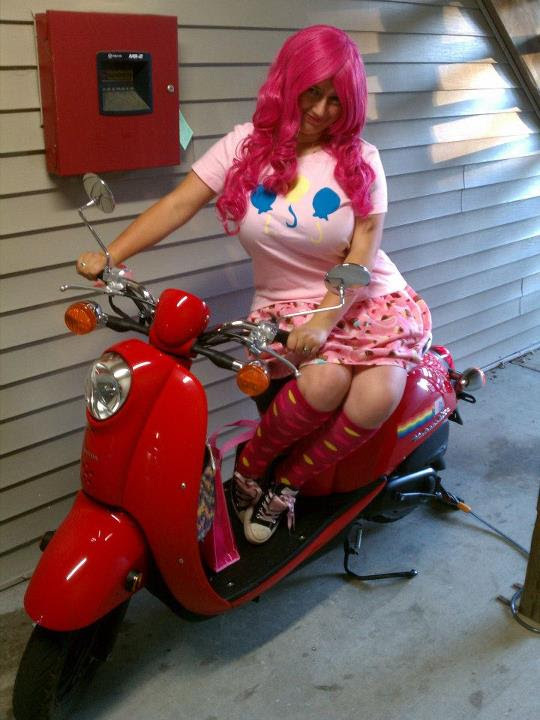 2014 saw Pinkie Pie in her tutu-bedecked form dragged out to every convention I went to – I think there might be a couple followers of the blog who recognize 2014 Pinkie, heh. An early version of Tutu-Pie. 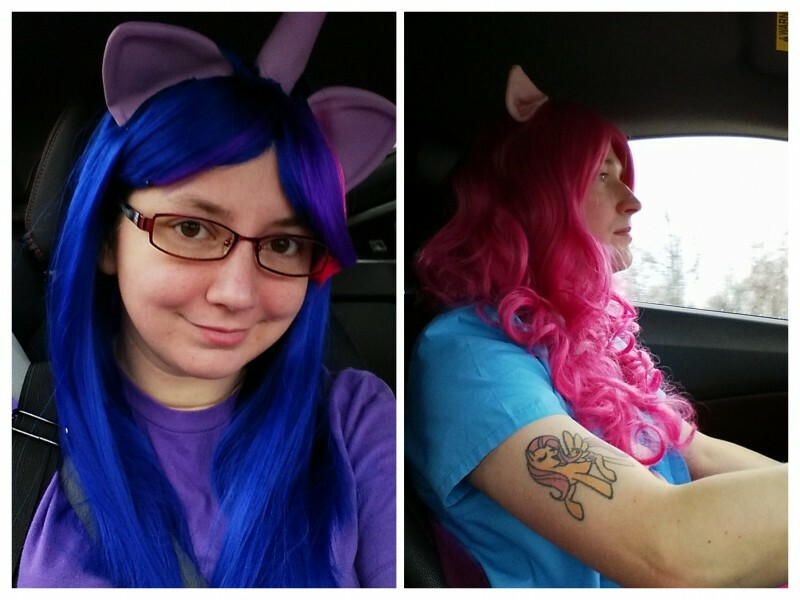 I tried to do something different in 2015, though: I went as *gasp* Twilight Sparkle. And Ross went as Pinkie Pie! I’ll be completely honest – she’s my favorite pony. Pinkie is fun to cosplay as, but I pretty much am Twilight Sparkle. And it was fun to wander around PopCon in a much more low-key costume. 2016 did not involve any conventions, sadly. Which was a huge bummer for me – as I mentioned at the beginning of this post, I love dressing up in costumes. A lot. And not going to any conventions that year, due to either them being poorly organized in the past and not wanting to deal with it again (like Indiana Comic Con), or the convention sneaking up on us (like PopCon! ), or the convention landing smack dab in the middle of packing/moving/wedding prep (good lord how I missed Gen Con last year). 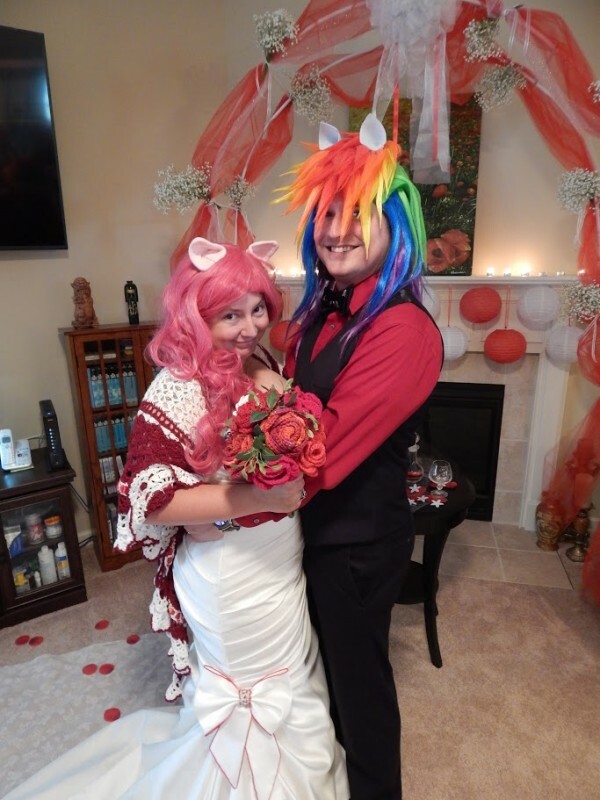 I at least did get to dress up for the wedding, but it wasn’t quite the same – at least until the pony wigs came out. Wedding Pinkie! This totally counts, right? Speaking of Gen Con, it’s NEXT WEEK OMG. I am SO EXCITED.